After posting about Evelyn De Morgan’s painting The Gilded Cage, I began to think about other paintings that depict women who are trapped and imprisoned in some way, paintings that prompt me to ponder limitations and boundaries. 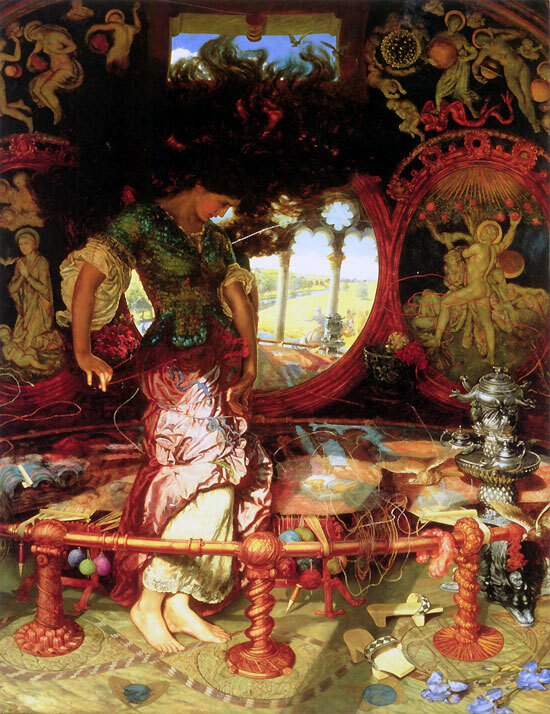 The Lady of Shalott is perhaps the most obvious example that comes to mind. 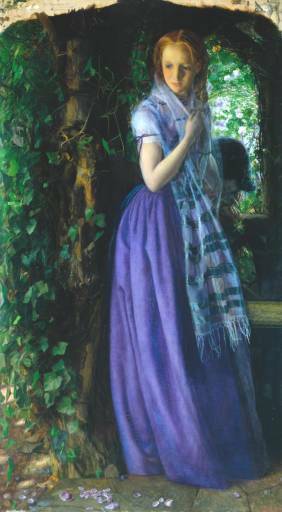 Based upon the poem of the same name by Alfred Lord Tennyson, several Pre-Raphaelite artists painted the Lady who is imprisoned within ‘four grey walls, and four grey towers’. Shut away from life, the Lady is doomed to only see life through the reflections of a mirror. She weaves what she she sees into a tapestry. If she looks away from the mirror and looks upon life herself, the curse will come upon her. Tennyson’s full poem is here. The Lady is relegated to a different sphere, not participating in life, but observing it through reflection. When she chooses to cross the boundary of that sphere, she is punished. 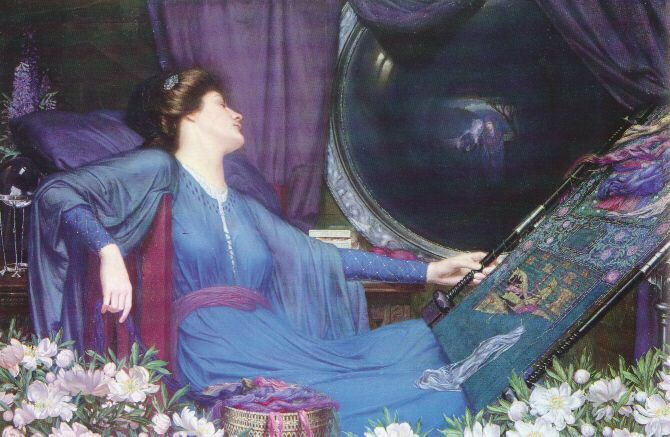 Why were the Pre-Raphaelites and their followers so keen to paint The Lady of Shalott? It could be that they were drawn to the pathos of the death of a beautiful woman. 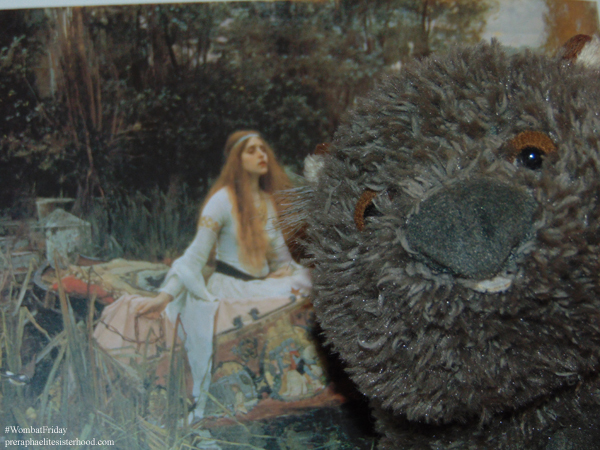 Ophelia’s death in Hamlet, for example, was another common subject for the Pre-Raphaelites. Dante Gabriel Rossetti was inspired by Edgar Allan Poe’s The Raven when he wrote The Blessed Damozel. Poe described the subject of The Raven, saying “When it most closely allies itself to Beauty: the death then of a beautiful woman is unquestionably the most poetical topic in the world, and equally is it beyond doubt that the lips best suited for such topic are those of a bereaved lover.” This concept of beauty, death, and the separation of lovers was the impetus for Rossetti’s Blessed Damozel. 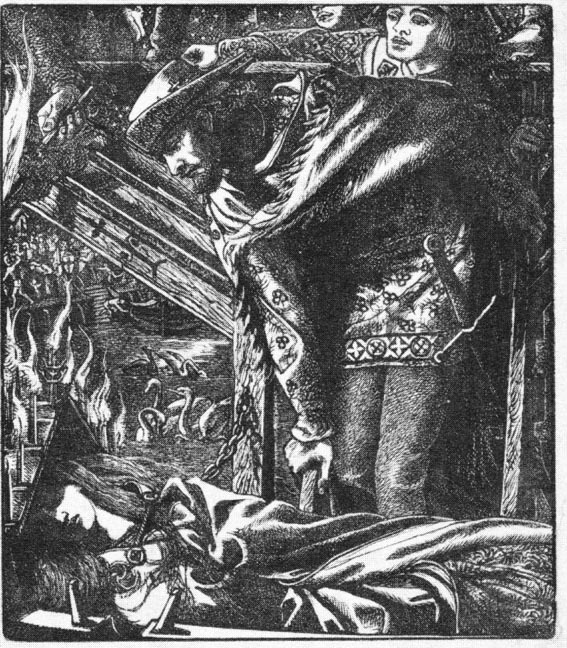 Poe’s description of the poetic death of a beautiful woman applies to Lenore of The Raven, Hamlet’s Ophelia, and The Lady of Shalott. 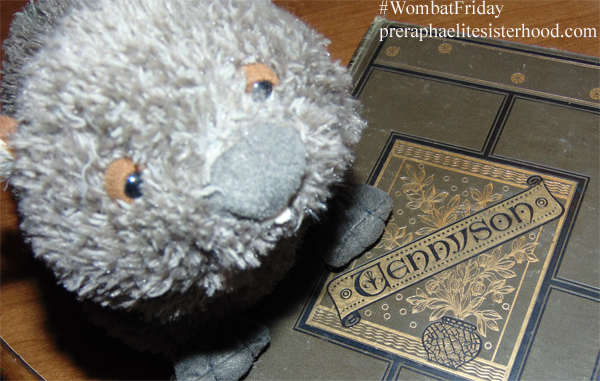 However, the Pre-Raphaelites may not have been interested in merely depicting the death of a great beauty. They were also exploring deeper themes presented by Tennyson’s poem. There are gender and social themes, as well as the notion that the poem is an allegory about the life of an artist. 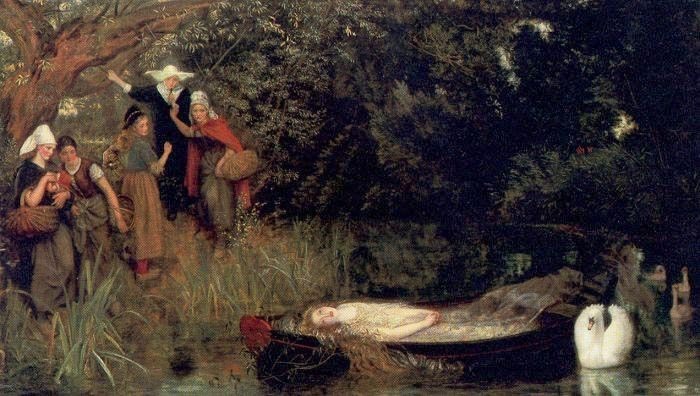 For those of us who love Tennyson’s poem, we are lucky indeed as there are so many paintings of the Lady of Shalott that we have the perspectives of several artists to analyze. 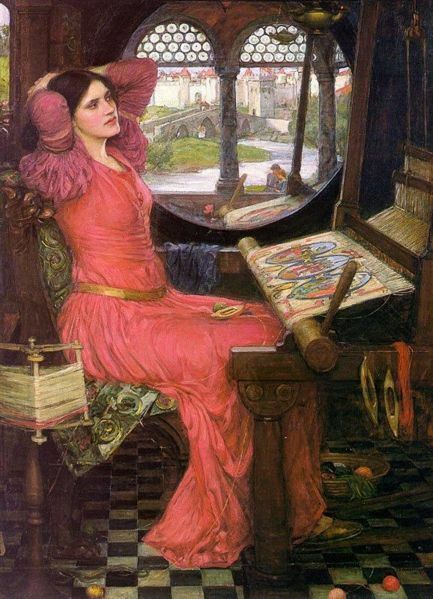 While Pre-Raphaelite artists were devoted to painting from nature, the Lady of Shalott was afforded no such luxury. Her tapestries were based on images seen through supernatural means. There is no explanation as to how or why the happenings of the world appear on her mirror. In the context of the poem, the Lady seems not to question this or the mysterious curse. The images appear as reflections and she weaves them as they come. 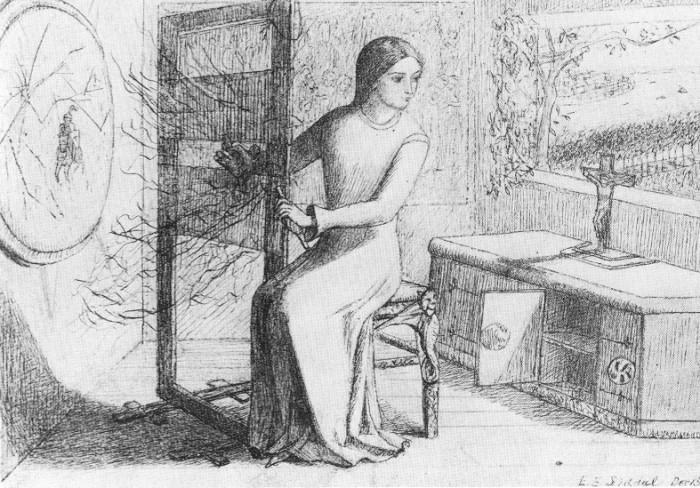 A mirror is a reversal of reality and when she does the exact opposite and looks out of the window, that action breaks the mirror and her tapestries spread out in a web-like fashion. 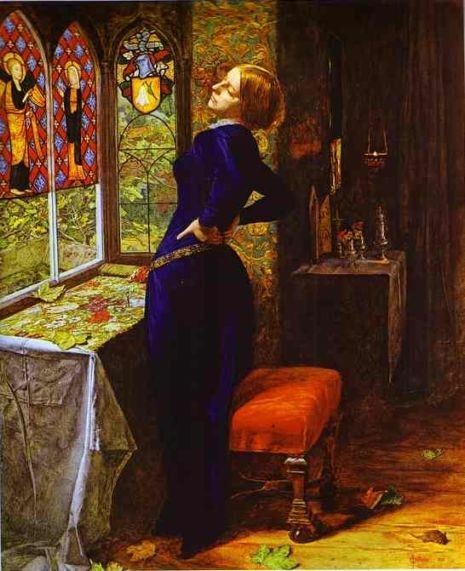 I think it is important to note that she does not look out of the window merely because she is smitten with Lancelot’s appearance. It was his singing voice that captured her attention. She hears him sing and is compelled to go to the window, causing the curse to descend upon her and her work. Her own artistry is ruined and forgotten because she seeks another artist: the man whose song moved her. It is possible that Dante Gabriel Rossetti used Elizabeth Siddal’s facial features in his 1857 drawing for Edward Moxon’s illustrated collection of Tennyson’s poems, making Siddal an artist who both created her own Lady of Shalott as well as appearing as the Lady of Shalott at a later date. 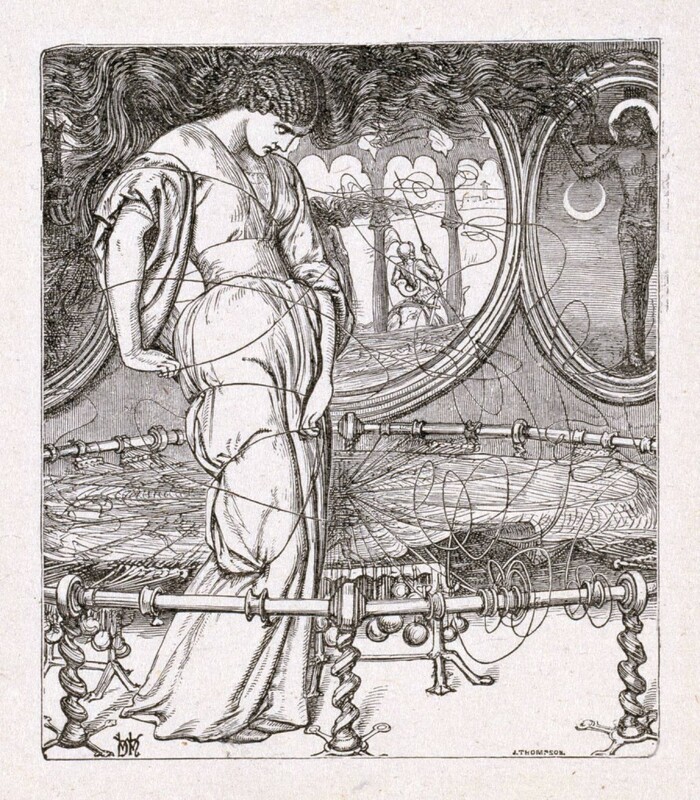 Dante Gabriel Rossetti’s illustration for The Lady of Shalott, published in Moxon’s Tennyson. It is over a hundred years old and the poem still captivates, inspiring us to write about it and create new works in its honor. I’ve previously written about a possible modern interpretation of the Lady’s curse and Kirsty Stonell Walker recently wrote an interesting piece, That’s Shalott. The popular web comic Hark, A Vagrant tackled it in a delightfully funny manner. Perhaps the most famous nod to the poem is Loreena McKennit’s song, which has probably introduced legions of fans to Tennyson’s words. Doomed to view life through reflections, her life is a mere shadow with no experiences of her own. 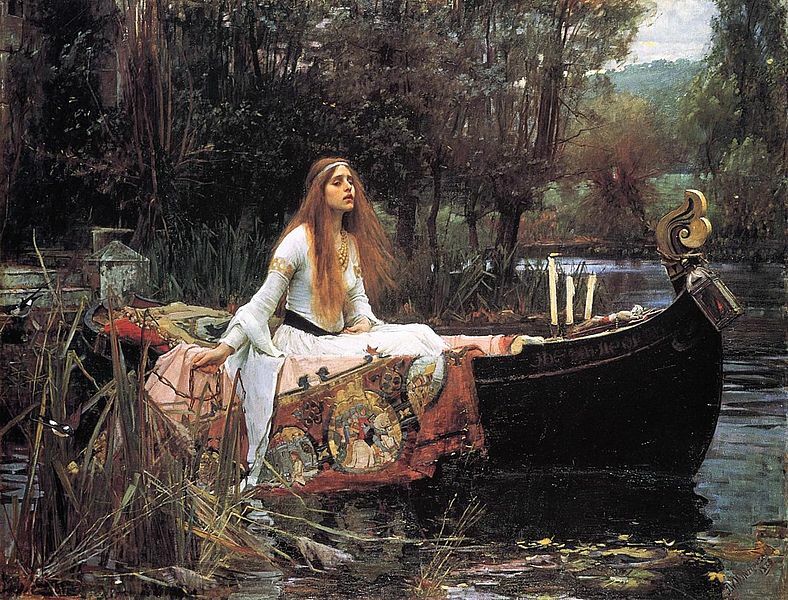 I think that we should use that as inspiration, that The Lady of Shalott can be a symbol of strength and daring. There are multiple ways to interpret the poem but I like the idea of using it to inspire modern women to have the courage to spin our own webs, inspired by our own thoughts and experiences instead of as reflections of what society tells us to be. It is amazing how one never tires of hearing people’s thoughts on this wonderful, hypnotic poem! Just one thought – Tennyson wrote a later poem “Lancelot and Elaine” as part of the Idylls of the King. Elaine is described as the “maid of Astolat” and I think this story may shed some light on the origins of the lady of shallot (I think Tennyson admitted that he’d never heard of the story of the maid of Astolat when he wrote the Lady of Shallot). It’s interesting in that scene from Anne of Green Gables where she reenacts the body floating down the river on the barge, that she refers to the Lady as Elaine i.e. Lucy Maud Montgomery must have been familiar with the later poem. (Another idea I read somewhere was that Lancelot had already met the Lady [as described in the Elaine poem] and that it was Guinevere who in her jealousy got someone to put the curse on her).